We've been awaiting official word on the Denver Broncos' NIKE collars, which appear to have been slightly tweaked since last season. On Wednesday, NBC perhaps inadvertently confirmed those changes, tweeting a photo of quarterback Peyton Manning sporting an all-blue collar. This, of course, is a change from the half-blue, half-orange look that the team wore in 2012. Manning was doing both photo and video shots with NBC, which the network will use in their new Sunday Night Football intro this fall. NBC announced earlier today that Manning would be part of the spot. 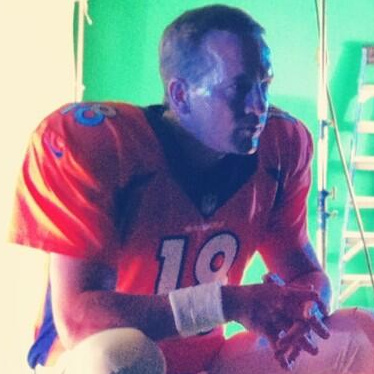 To see more photos from Manning's shoot with NBC, check out our Facebook photo album. The Broncos will play three games on NBC this fall, starting with a Week 1 season opener against the Baltimore Ravens on Thursday, September 5. That will also mark the regular season debut of the team's new collars, which are still to be officially confirmed by the team. Update: As Sayre Bedinger has noted, the NFL Players Association released an image of running back Montee Ball earlier this week that showed the rookie in the 2012-styled collar. But Manning and his all-blue collar will be shown on NBC every week this fall—the team probably wouldn't have sent him to a shoot in any other uniform than the one they plan on wearing on Sundays this season.